For our April 26th meeting it was good to be back in the Community Room! We had an insightful Post-NAB panel moderated by LAPPG’s Woody Woodhall. Panelists included: Philip Hodgetts, Clint Milby, Andy Shipsides and Lucas Wilson. We thank them for sharing their time and expertise with the group! Following our networking break busy AE Monica Daniel shared a very well planned presentation about working as an Assistant Editor in Scripted Television. She answered many questions and shared her story as well as a very detailed look at the work she does and the skills that are needed to be successful in this competitive role. A big thanks to Monica as well for her generosity! The Tenth Annual Creative Storage Conference (SM) (CS 2016) will be held Thursday June 23, 2016 at the DoubleTree Hotel West Los Angeles in Culver City, CA (www.creativestorage.org). This event brings together digital storage providers, equipment and software manufacturers and professional media and entertainment end users to explore the conference theme of “The Art of Storage”. At CS 2016 you can find out the latest developments in digital storage for media and entertainment and network with industry professionals. Hear how major media equipment suppliers and entertainment industry customers use digital storage technology in all aspects of content creation and distribution. Find out the role that digital storage plays in new content distribution and marketing opportunities for a rapidly evolving market. See presentations on digital storage in digital acquisition and capture, non-linear editing and special effects. Find out how to convert and preserve content digitally and protect it in long-term dependable archives. Learn about new ways to create and use content metadata, making it easier to find and use. Discover how to combine and leverage hard disk drives, flash memory, magnetic tape and optical storage technology with new opportunities in the digital media market. Be at the juncture of digital storage and the next generation of storage for the professional media market. Meet folks that can help you further your business and your career as well as future collaborators! Corporate sponsors and exhibitors include Advantage Video, HGST, Micron, SGL, Spectra Logic, SwiftStack and Visuality Systems. Media and Organization Sponsors include the AMIA, Bright Blue Innovations Intl., Broadcast Beat, Colonial Purchasing, Coughlin Associates, DCIA, Digital Cinema Society, Digital Production Buzz, Entertainment Technology Center (USC), Drive Trust Alliance, Entertainment Storage Alliance, Flash Memory Summit, HDDFA, Home Toys/AVSystems, M&E Tech, MESS, Parks Associates, Popnetmedia, Post Magazine, PostPerspective, Postproduction.com, ProductionHub.com, RDC, reviewster, SATA-io, STA, SMPTE, SNIA, Tech Target, The Broadcast Bridge, Trusted Computing Group and The Shindler Perspective. 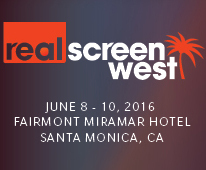 The next must-attend event for anyone in the business of production, distribution or broadcasting of reality television and factual entertainment, Realscreen West, takes place June 8 – 10, 2016 in Santa Monica, CA. Last year’s event attracted over 1,200 delegates from around the globe for three days of panels, pitching and networking. Over 300 of those in attendance were buyers of unscripted programming, making Realscreen West the perfect venue for making connections and doing business! Register today to take advantage of the early bird rate of US$925; offer expires Friday, April 22, 2016. Cine Gear Expo 2016 is the premier annual event for professionals engaged in the technology, entertainment and media industry. The show lasts four days in Los Angeles this June in Hollywood, California. Cine Gear features more than 300+ exhibits, new product and service introductions, 30+ complimentary seminars led by industry leaders, master classes, film competition, awards ceremony, special screenings in state of the art theaters and ample opportunity to network with peers within a studio environment. Dates: June 2nd – 5th, 2016. For regular updates continue to check back at http://www.cinegearexpo.com. Or connect with one of our social media channels. All attendee’s must complete the FREE Cine Gear Badge registration process. Click here to register. Registration is free until midnight, May 27th 2016 Midnight PST. After that time, a $30.00 CASH admission fee will apply to all new registrants, payable at registration. No Exceptions! Heading to NAB? Join our friends at the 15th Annual Las Vegas SuperMeet on Tuesday, April 19th from 4:30 – 11:00pm at the Rio Hotel’s Pavillion Ballroom. Don’t miss this chance to mingle, network, enjoy a few cocktails and party with industry peers while learning latest trends in collaborative editing workflows!